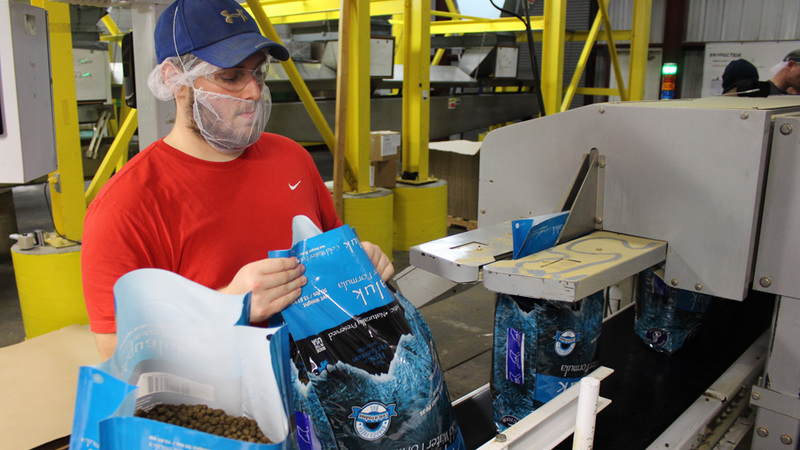 LISBON, Ohio – A Lisbon-based manufacturer of pet foods says the acquisition of two production operations in Wisconsin and New York has enabled his company to triple its business and expand its international footprint. BrightPet Nutrition Group acquired Southern Tier Pet Nutrition in Sherburne, New York, several years ago and within the last three months completed the purchase of Phoebe Pet Products in Kiel, Wisconsin. “We can now make freeze-dried, baked and organic treats as well as kibble that is exportable to the entire world,” Golladay says. The company manufactures its own brands of premium and super-premium pet food for dogs and cats under the Blackwood and Adirondack labels. It maintains a substantial business producing pet food for other ventures all over the world. “Blackwood was originally a customer” – he pauses – “a 25-year-old brand that we were making the entire time,” he says, until Ohio Pet Foods acquired the brand about eight years ago. The brand is today in 12 countries and 40 states. When you add in the contract manufacturing business, exports from the United States reach between 25 and 30 countries, he says. More recently, Golladay returned from a trade show in Germany – the largest of its kind in the world – in which he connected with clients and talked to others about potential business in other countries. The Ohio operations, Golladay says, is near capacity even after the company completed a recent expansion of its offices in Lisbon. “Our expansion comes through acquisition and through adding additional equipment and buildings,” he says. About 70 employees work in Lisbon while another 75 or so are employed in New York. The operations in Wisconsin employ between 30 and 40 people, Golladay says. Golladay’s father, grandfather and cousin established Ohio Pet Foods in 1978 after the family sold a feed mill that it owned in Rogers. Initially, the company produced generic pet food for retail chains but then opted to concentrate on manufacturing premium and super-premium foods. Pictured: Jordan Everett seals dog food bags before they’re shipped to customers. Batches of food containing specific recipes are made at the Lisbon plant and are cooked and solidified to a Play-Doh-like consistency. The material is then extruded and pushed through a die that forms the shape of the food as a fast-moving blade at the end of the extrusion line chops the food into small bits. The kibble is then dried, packaged and shipped to customers. Ingredients for Ohio Pet Foods products are tested first to ensure that they are up to standards, adds Kelly Wetzler, operations manager. “Once it’s made, it’ll be tested again and then sent to an outside lab to make sure everything is up to standards,” she notes. The new lab is just one component of the expanded office building of the company. “We already quickly filled up this space,” Wetzler notes. Other amenities include a new kitchen, parking lot and conference room. How pet food is manufactured has changed little over the years, Golladay says, but the company research related to animal nutrition has improved the quality. “We did a study with Kansas State University to mark how you cook a product and how the animal can take up that nutrition,” he says. Moreover, in new studies, researchers have discovered the benefits of adding probiotics and organic ingredients to the dog or cat food in order to boost pet health. And that’s the direction where the industry is moving, Golladay says. “Pets are like children,” he relates. Thus, more owners are taking special care to ensure that the foods they provide their pets are of high quality and healthful to digest. “The things we see on TV for ourselves – the probiotics, the gut health, the organics, the all-naturals – that is just as strong a trend, if not more so, for pets,” he says. Pictured at top: Matt Golladay, president of BrightPet Nutrition Group, holds Bella the Shitszu.